"Great job! I feel so much better that the wall is secure." Click on the tabs below to read some of the case studies we have compiled based on some of our biggest projects. There is a lot of research and planning that goes into Keystone Foundation Repair's services we provide. Take a close-up look at how we provide better foundations for large industrial structures, sink hole remediation, sunken foundation repairs and more. 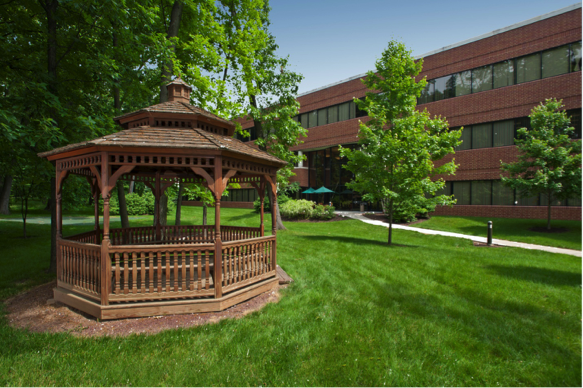 Each project involves an in-depth, detailed examination, and an assessment of its conditions. From here, we make our plan of action for how to resolve the issue. A 50ft tall staircase down to a dock on the Chesapeake. It had a beautiful view but unfortunately it was built with wooden posts dug shallow into the ground. The stair tower was beginning to lean out towards the water. As a structural retrofit to the existing staircase structure a steel structure was going to be built to attach to the stair case. This steel structure was to be supported on adequate piles. 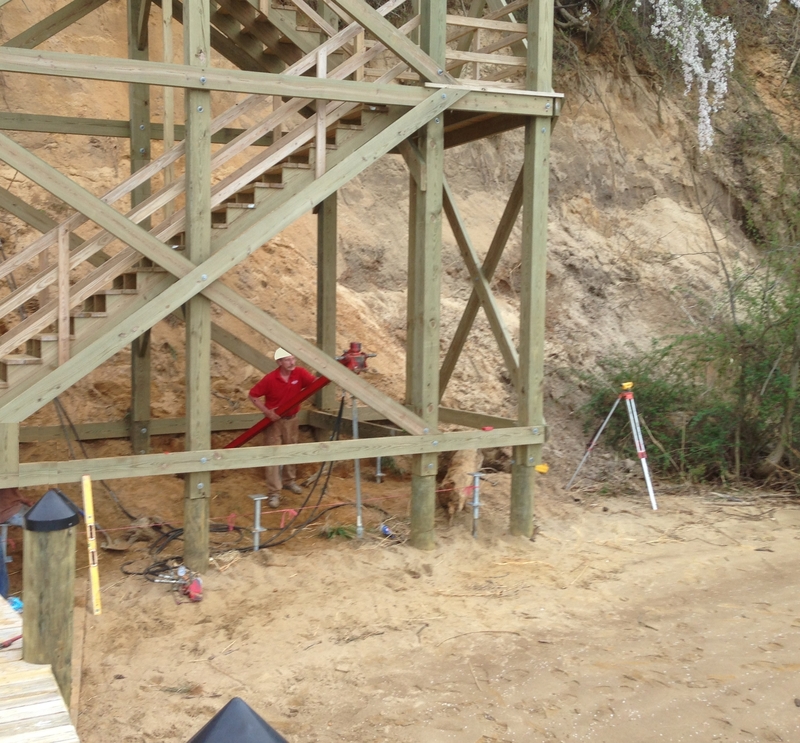 Helical piles were chosen because of their ability to be installed where access is difficult. 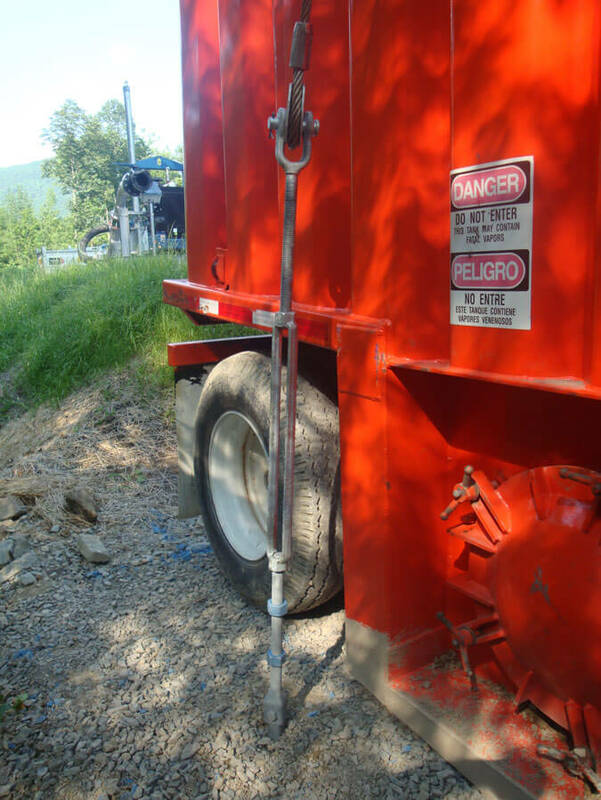 The helical piles were installed with a small hand held drive head. All eight piles were installed to a depth of 20ft in one day. Their galvanized custom design caps will be welded to long pieces of channel steel and be part of a new steel structure that will clamp to the existing structure. Further movement is arrested. 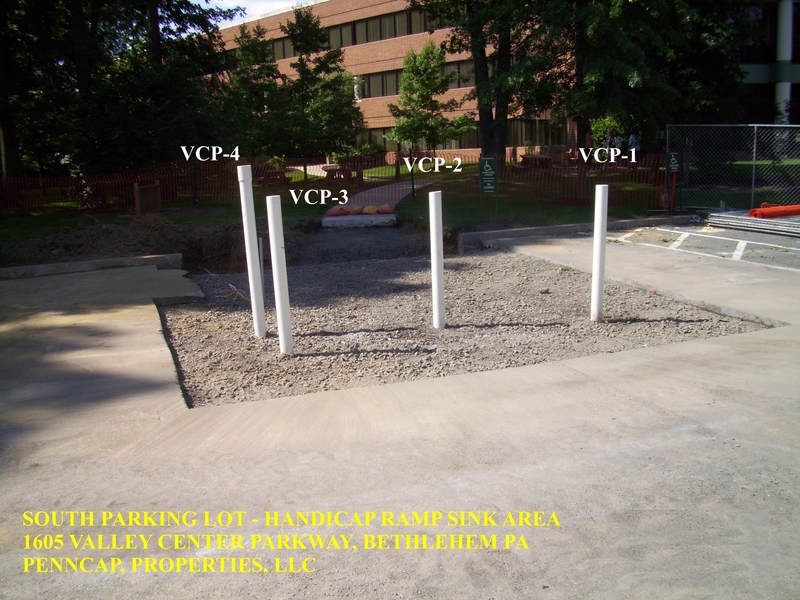 A joint between the asphalt parking area and curb allowed for water to drain beneath the parking area. Over time a small sink hole developed and a portion of the asphalt collapsed . Unfortunately in close vicinity was a 36” pre-cast storm drain running below. The water had eroded the soil around the storm drain but had not yet caused the storm drain to misalign or leak. The storm drain pipe was inspected and dirt compacted to either side of it. A concrete cap was placed on top. PVC pipe was left at locations to mark the compaction grout points. Grout Casing is drilled at the designated points until load bearing rock strata is reached. The low mobility grout is pumped beneath the storm drain to compact the soils that had loosened due to the sinkhole. The grout is monitored for the correct slump, volume and pressure as the compaction grouting occurs. Learn more about sink hole remediation. The main compressor at the station was contained in a tilt up panel building. The tilt up panels were set on a knee wall and footer. Both the knee wall and footer had spalled and deteriorated due to excessive use of calcium chloride during construction in the 1970’s. A method was devised to transfer the panel loads to a deep foundation of drilled hollow bar piles. 38mm hollow bar piles with a 3” bit were driven through clay and shale to depth of approximately 20ft. The piles were rated at an ultimate capacity of 70kips. Two different size dills were used as a smaller dill was needed to work close to the gas lines coming around the back of the building. All Piles were cased with a 3.5”O.D. pipe to a depth of 10’ and neat cement filled. I-beams were then welded on top of the piles and clamped to the bottom of the tilt up panels. Concrete was formed around the above grade portion of the piles and behind the I beam. 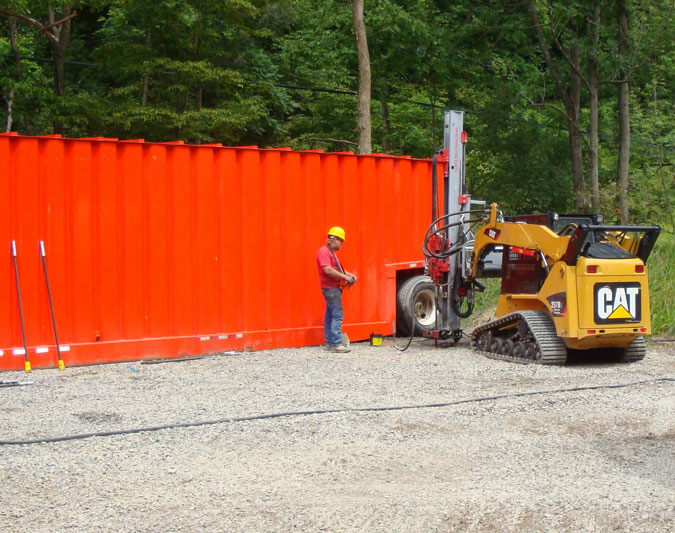 Water storage tanks were needed for hydraulic fracturing of gas wells. The tanks were positioned in a flood plane and had a possibility of floating away when they were empty. Shale was shallow at approximately 5ft depth. 32mm hollow bar was installed with a 76mm bit. The bar was anchored 15ft into the shale for a working capacity of 20 Kips. 36 hollow bar anchors were installed in one day. All anchors were connected to cable tie-downs. The tanks are now secure even in flood situations.